The Andromeda Galaxy with M110 at upper left and M32 to the right of the core. The Andromeda Galaxy (M31) has satellite galaxies just like the Milky Way. Orbiting M31 are at least 14 dwarf galaxies: the brightest and largest is M32, which can be seen with a basic telescope. The second brightest and closest one to M32 is M110. The other galaxies are fainter, and were mostly discovered only starting from the 1970s. 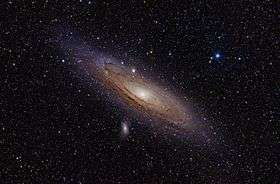 On January 11, 2006, it was announced that Andromeda Galaxy's faint companion galaxies lie on or close to a single plane running through the Andromeda Galaxy's center. This unexpected distribution is not obviously understood in the context of current models for galaxy formation. The plane of satellite galaxies points toward a nearby group of galaxies (M81 Group), possibly tracing the large-scale distribution of dark matter. Andromeda Galaxy's satellites are listed here by discovery (orbital distance is not known). Andromeda IV * dIm? 22-24 00h 42m 32.798s +40° 34′ 16.27″ +16.6 1972 previously believed to be a satellite of Andromeda, but disproven in 2014. * It is uncertain whether it is a companion galaxy of the Andromeda Galaxy. ** RA/DEC values marked in Italics are rough estimates. Andromeda Galaxy (M31) seen in infrared, with the hole arc at bottom right. New images from NASA's Spitzer Space Telescope shed light on the Andromeda Galaxy's violent past. The images show that one of the latter's satellite galaxies, M32, blasted through one of the Andromeda Galaxy's spiral arms a few million years ago. Infrared pictures of the galaxy's two spiral arms demonstrate that they and the prominent star-forming ring are separate structures. The images also show a hole where the rings seem to split into arcs. This hole is where astronomers believe M32 punched through Andromeda's galactic disk. 1 2 The scatter about the 'Universal' dwarf spheroidal mass profile: a kinematic study of the M31 satellites And V and And VI, Collins, M.L.M. et al., 2011. 1 2 3 Discovery and analysis of three faint dwarf galaxies and a globular cluster in the outer halo of the Andromeda galaxy, N. F. Martin et.al, 2006. Andromeda's thin sheet of satellites - Dark matter filiments or galaxtic cannibalism?